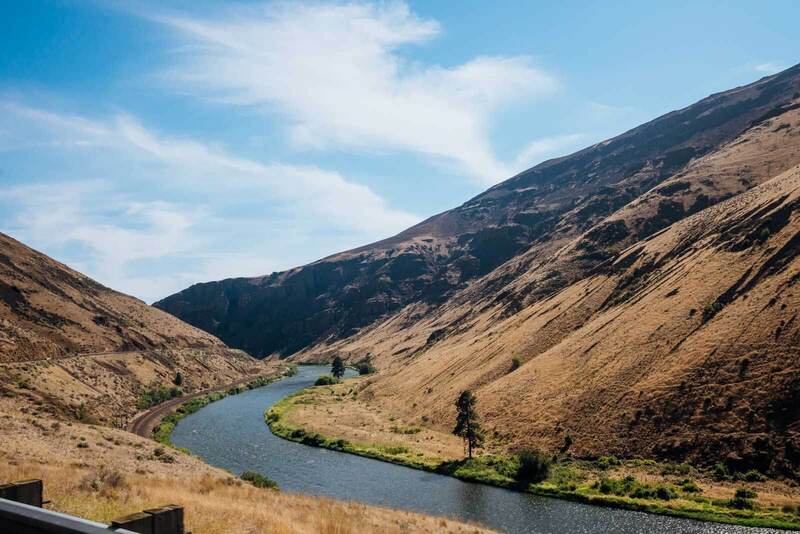 Find out why we think Yakima Valley is one of the best weekend trips from Seattle. Yakima Valley has it all for anyone who loves to enjoy an adult beverage from time to time. Being the number one producer of hops in the world you would think that Yakima Valley would be hundreds of breweries, but there’s not. The region itself only has about 15 breweries and many of which just started popping up in the past 5 years, some even just before our visit, even though hops have been growing in this region for much longer. What’s exciting about that is that the brewery scene is young in this distinctively hop heaven and all signs are pointing that this area is going to keep opening up more and more microbrews. 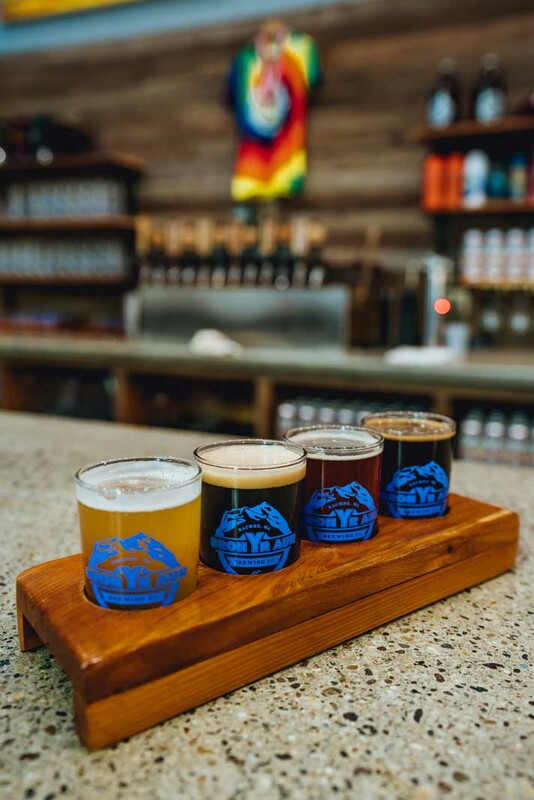 Keep Yakima Valley on your radar because this area is about to explode since it’s been sitting on a gold mine of hops for years making Yakima Valley an awesome getaway near Seattle for anyone who loves a good beer. One of our favorites is Bale Breaker Brewing located in a commercial hop field with a dozen beers on tap to taste! Yakima Valley is also a great weekend trip from Seattle if you’re into wine tasting. 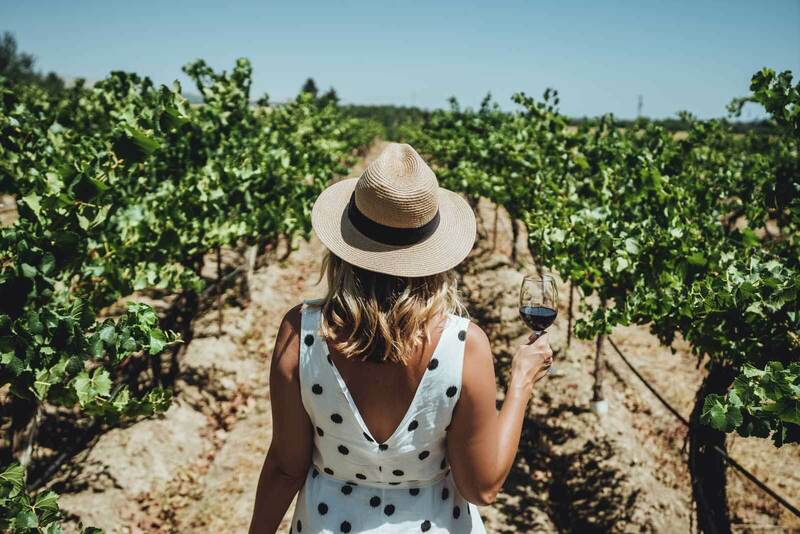 The Rattlesnake Hills produces some of Washington’s best wines thanks to its rich soil in the region, warm climate, and long days ideal for vineyards and winemaking. The Rattlesnake Hills area alone has 12 wineries to enjoy, but Yakima Valley has over 100 wineries in the area. Check out our favorite things to do in Yakima Valley for our picks of best wineries to visit. Besides boasting great wine and beer, Yakima Valley is also home to some fantastic ciders which makes sense since within 100 miles of Yakima Valley are where 70% of the US apples are grown. You can visit the tasting room of Tieton Cider Works near downtown Yakima for their original ciders and their signature seasonal ciders that are to die for or you can stop by different spots like Hoptown Wood Fire Pizza where they specialize in wood fired pizza but also make their own cider. 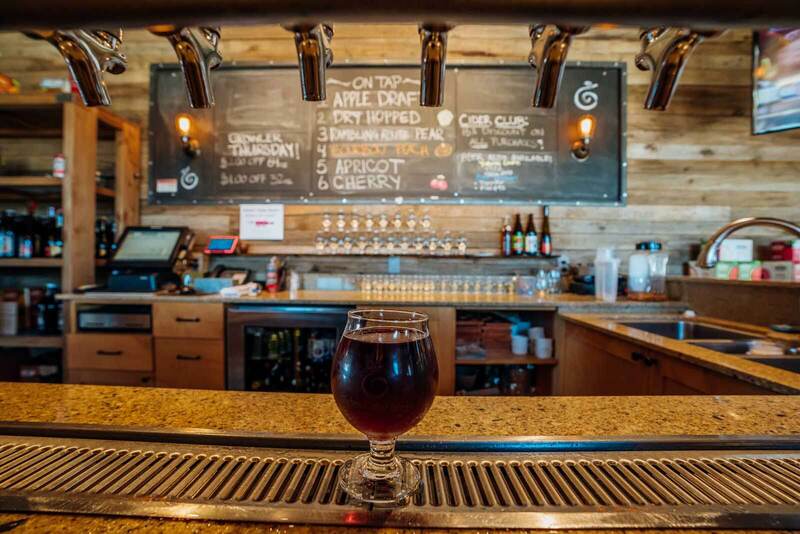 I never knew I was a cider fan until this visit and those seasonal ciders at Tieton Cider Works would give me an excuse to take a weekend trip from Seattle every season if we lived in the area. One of the greatest reasons why Yakima Valley is an amazing weekend trip from Seattle in the spring and summer is your access to all the best fresh fruit straight from the source. We visited a few different U pick during our trip mid July where we got to sample delicious sweetheart cherries from Thompson’s Farm, amazing varieties of blackberries and raspberries from Ahtanum Berry Patch, and more fresh cherries from Barrett Orchards. We have never tasted any better fruit in our lives than picking them straight off the trees ourselves. 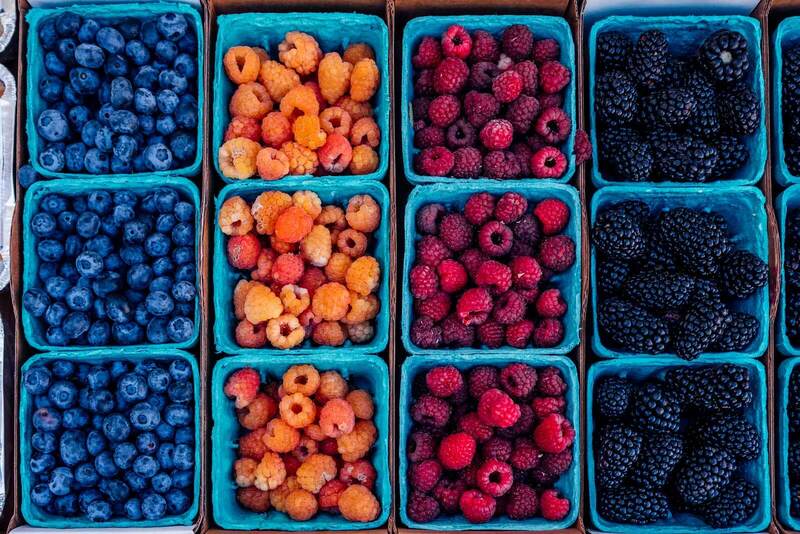 Depending on when you go you can get apples, nectarines, pears, cherries, blackberries, raspberries, pumpkins, asparagus, mint, and tons more making it an amazing getaway near Seattle if you want access to some of the best fruit and produce in the country. 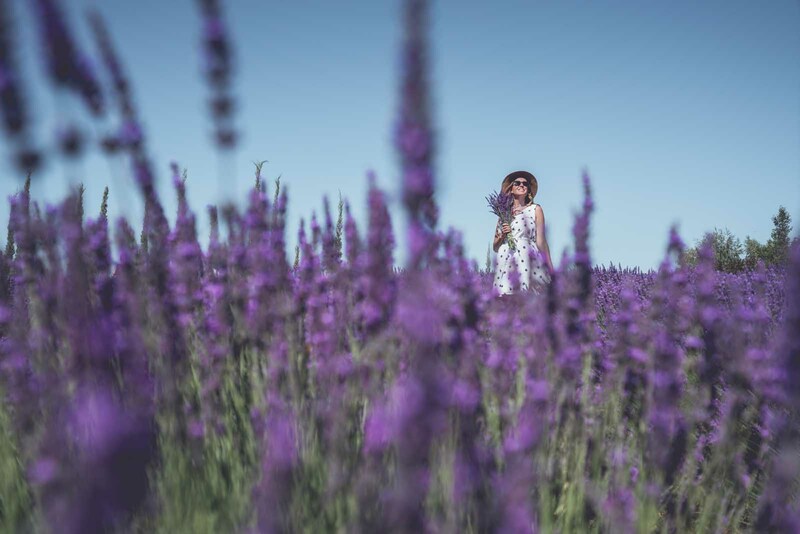 To sweeten the pot you can also visit the lavender farms and pick up a few bundles of fresh lavender before returning to the city, nothing smelled better than being surrounded by fields of fresh lavender. Another amazing reason why Yakima Valley is one of the best weekend trips from Seattle would be all the outdoor activities this area has to offer. 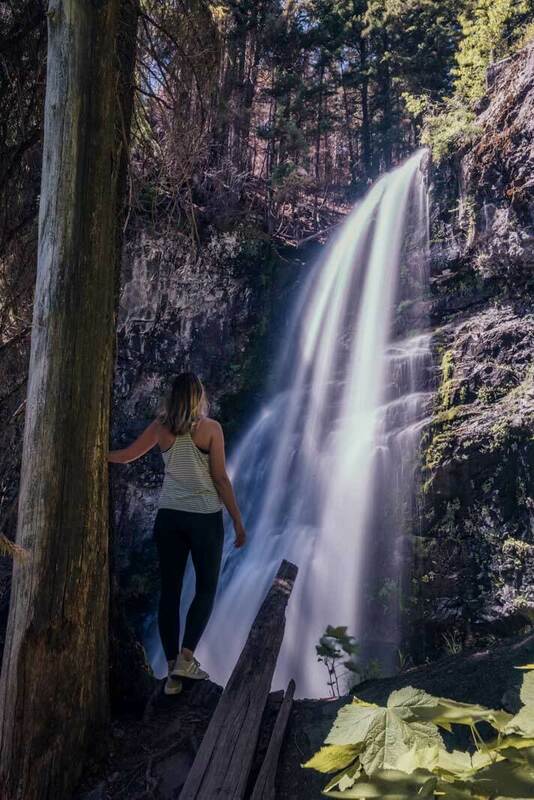 From hiking through Cowiche Canyon, Naches, or Wenatchee National Forest you have a lifetime of hikes to enjoy whether it’s through a scenic canyon, up to a waterfall, or views of the Cascades you can’t go wrong. Then there are the scenic drives like Chinook Pass and White Pass Scenic Byway that take you through a gorgeous winding road with rewarding views of Mt. Rainer up close. In the winter, you can stop to ski or snowboard at White Pass Ski Resort. One of our favorite stops and stays was at Elk Ridge Campground in Naches. 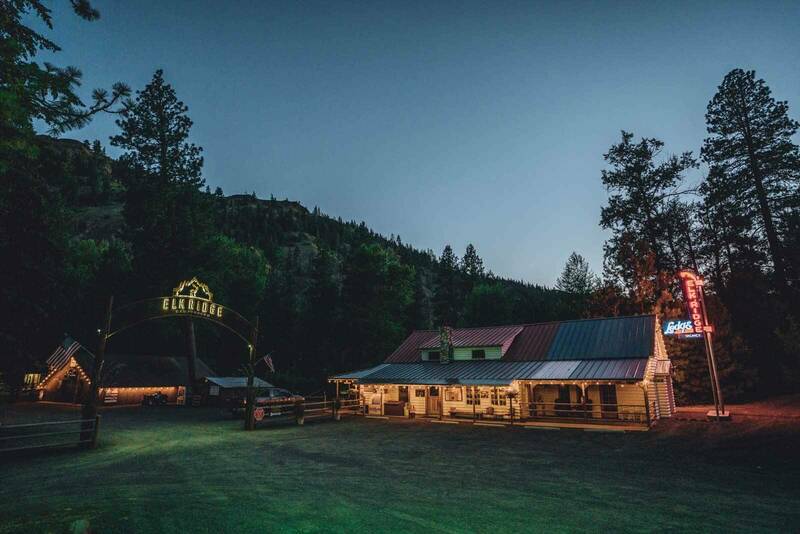 This campground offers RV spots, a lodge for large families, and basic cabins that are historic and some that date back to over 100 years old to sleep in next to the river along the mountains in one of the most tranquil places we’ve ever been. Besides being a complete dream of a campground you are greeted by the friendly owners who help create fond memories on your getaway near Seattle on their slice of paradise in the mountains. Another outdoor activity that makes Yakima Valley one of the best weekend trips from Seattle is the river rafting in Yakima Canyon River. Float and relax for hours down the river with your packed lunch and friends enjoying the amazing canyon views. You can bring your own float or rent one at the many different establishments along the canyon and river including Red’s Fly Shop. Nothing makes for a perfect weekend getaway near Seattle than the quiet, scenic countryside seen by floating down the river with the refreshingly cool river water. 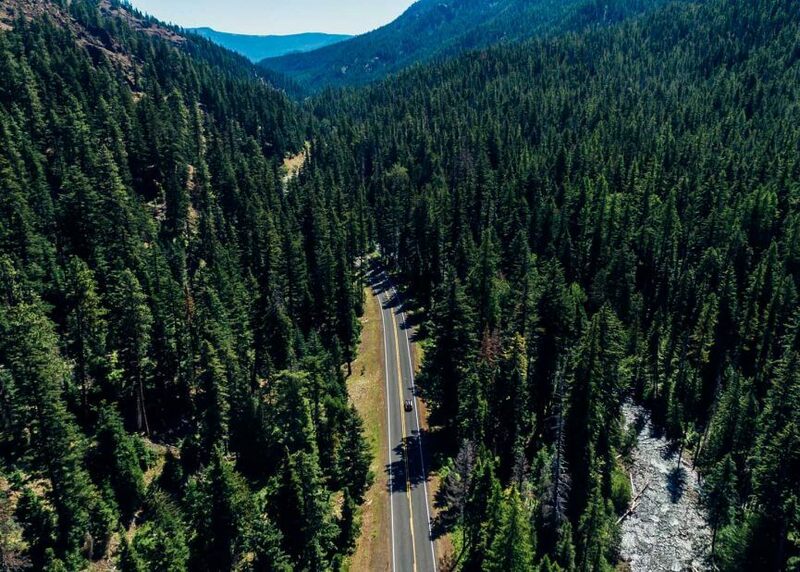 Whether you’re driving along the scenic byways or wine tasting in the Rattlesnake Hills you can get stunning views of the Cascade mountains off in the distance including Mt. Rainer and Mt. Hood making it one of the many reasons why Yakima Valley is one of the best weekend getaways from Seattle. Sure, you can see Mt. Rainer far off in the distance in certain parts of Seattle on a clear day, but imagine driving up close to Mt. 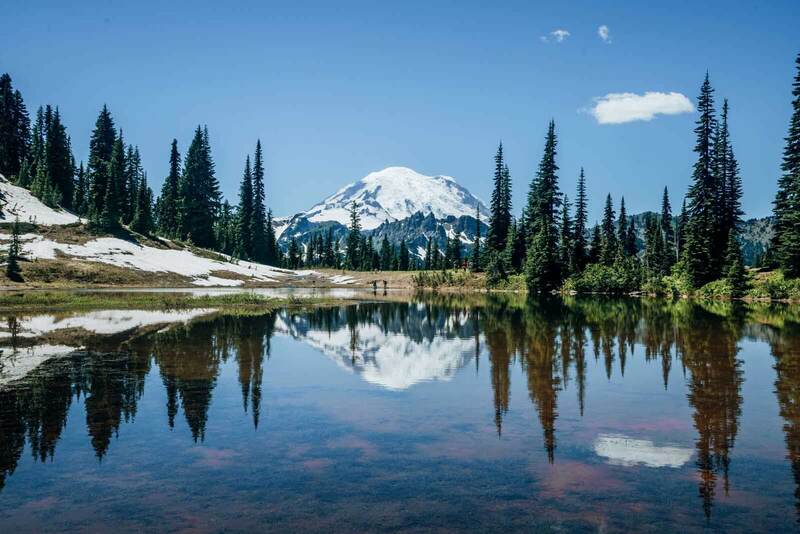 Rainer on Chinook Pass or White Pass Scenic Byway where you can park your car and hike around snow in the summer with incredible and breathtaking views of Mt. Rainer up close and personal? Or imagine sipping on a glass of wine in a vineyard in Rattlesnake Hills while enjoying both the views of Mt. Adams and Mt. Rainer in the distance? That’s enough reason for us to make Yakima Valley a getaway near Seattle worth visiting. Last, but surely not least, another reason why Yakima Valley is becoming one of the best weekend trips from Seattle would be the foodie scene. With farm to table options like Crafted of Yakima where the chef sources everything locally from the farms in the Valley. 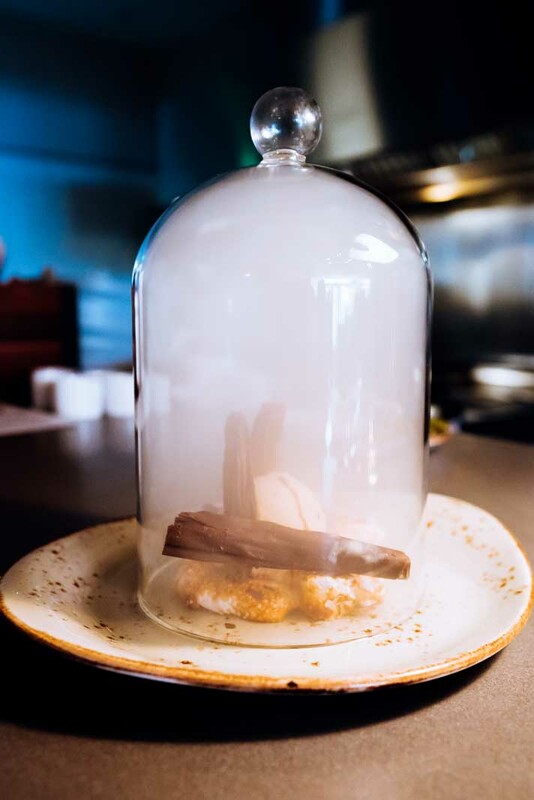 Besides having the freshest local ingredients they offer the chef’s menu which includes 7-8 courses off their daily menu of insatiable food and local wine pairing. Besides being one of our best meals in Yakima Valley, this was one of our favorite restaurant experiences period. To sweeten the pot, the chef’s menu is $65 a person making it worth the weekend trip from Seattle as you’re not paying Seattle prices anymore for amazing food. We also enjoyed the amazing food samplings from the Downtown Yakima Farmer’s Market on Sunday mornings, perfect timing for that weekend trip from Seattle before heading back to the city, or eating our way through the restaurants in downtown Yakima including Second Street Grill’s incredible menu, Provisions creative and tasty chef’s menu, and the great fare at Cowiche Canyon Kitchen and Icehouse. Besides restaurants in Yakima, many of the wineries and breweries bring in food trucks that serve up insanely good food from tacos to wood fire pizza. The food scene here is starting to explode and is legit making it well worth a trip or getaway near Seattle for some meals alone. Liked this post about why Yakima Valley is one of the best weekend trips from Seattle? Bookmark for later or share the love below on Pinterest.